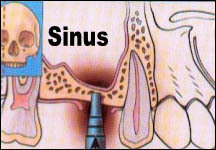 Placing implants in the back of the upper jaw may be limiting due to the size of the Sinus. In order to place an implant there must be adequate bone volume i.e. : width and height. If teeth were lost for a long time, the residual ridge shrinks and at the same time the sinus expands leaving little bone for the implant. A minimally invasive procedure has been developed to solve this problem called the Osteotome Technique. A bone graft material is inserted through the same opening that the implant will be placed with an instrument called an Osteotome to lift the lining of the sinus and allow for new bone formation. Usually the implant is placed at the same time. Osteotome displacing sinus membrane with bone graft material.